Attorney and public prosecutor Loretta Elizabeth Lynch was born on May 21, 1959 in Greensboro, North Carolina. Her father was a Baptist minister and her mother was an English teacher and school librarian. Lynch received a Bachelor of Arts degree from Harvard University in Cambridge, Massachusetts in 1981. Three years later, she earned a Juris Doctor degree from Harvard Law School. Lynch joined the New York City, New York law firm of Cahill Gordon & Reindel in 1984. Six years later, she became a drug and crime prosecutor in the office of the United States Attorney for the Eastern District of New York. From 1994 to 1998, she directed the Long Island office and worked on several cases involving corruption in the government of Brookhaven, New York. In 1999, President Bill Clinton nominated Lynch to serve as the United States Attorney for the Eastern District of New York. In a trial that received national attention, she helped win convictions of two white New York City police officers who severely beat and sexually assaulted Haitian immigrant Abner Louima. Lynch left office in 2001 and became a partner at Hogan & Hartson (later Hogan Lovells) in New York which focused on commercial litigation and corporate compliance issues. Lynch worked at the law firm for nine years. During that time, she was a member of the New York State Commission on Public Integrity. In 2010, President Barack Obama nominated Lynch to serve again as United States Attorney for the New York Eastern District. Some of her work involved high profile cases of political corruption. She successfully prosecuted a New York City councilman and a legislator in Nassau County on bribery charges and won the conviction of a former New York state senator who embezzled millions of dollars from a medical clinic in his district. Lynch’s office also handled terrorism cases. She secured the imprisonment of terrorists who plotted to bomb the New York Federal Reserve Bank and the New York subway system. 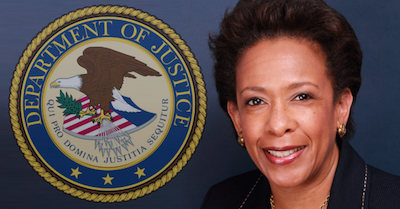 On November 28, 2014, President Obama nominated Lynch for the position of United States Attorney General. She was confirmed by the Judiciary Committee of the United States Senate and approved by the Senate by a vote of 56 to 43 on April 3, 2015, the first African American female Attorney General and the second woman to hold the office. Loretta Elizabeth Lynch is married and has two stepchildren. A G. Sulzberger, http://www.nytimes.com/2010/01/21/nyregion/21prosecutor.html, New York Times, January 20, 2010; Nicky Woolf, http://www.theguardian.com/us-news/2014/nov/08/loretta-lynch-level-headed-attorney-general, The Guardian, November 8, 2014; Athena Jones, http://www.cnn.com/2015/04/23/politics/loretta-lynch-attorney-general-vote/.